It’s crazy how time flies. 2013 was a year of personal and professional growth for me. Below is a summary of some major events from my year, what I learned and how I matured from many of these experiences, and what I’m looking to accomplish in 2014. I started off 2013 in the sunny British Virgin Islands where some friends and I rented and lived on a small sailboat for a week. What a trip that was. Directly following that experience, I got back to work at Stark with a lot of traveling ahead: first to Germany to attended Domotex Hannover, the world’s premier flooring tradeshow that takes places 4 times a year in different cities (I blogged about this trip here), next to visit Stark’s London showroom for my first time, then finally to Las Vegas to attend another flooring trade show called Surfaces. From all of this travel I learned about the types of strong international vendor relationships my father and uncle have established over the last 40 years, and how Stark Europe’s trade partners and interior designers differ from those of Stark USA; a market I hope to attach in the next few years. Upon my return in early February, it was time to contract a top-tier digital agency to aid Stark in re-launching our digital presence with a new website and digital strategy. I spent about 6 months interviewing different firms based all around the US, and after many rounds of interviews, conversations, and customer reviews, we finally felt comfortable moving forward with one firm. We have been working with that firm since February and are now building a website and online portal for our customers that will turn the traditional luxury flooring industry on its head. This new website and digital strategy will be launching in Q2 of 2014 and I could not be more excited for it! Working with this digital agency taught me a very valuable lesson: technology development always takes longer than expected and there is nothing you can do about it other than be patient and persistent. In March I went to China for 17 days with my father to attend the Domotex Shanghai trade show and visit our Chinese manufacturers located all around the country and in Hong Kong. This was my 2nd trip to China but the first one while working at Stark. In additional to meeting with vendors and exploring old and new partnership opportunities, I got to visit mills and see our products being woven firsthand, which provided me with a crash course in machine-made carpet manufacturing. This knowledge is something that continues to help me every week when assisting in sales support and customer service at Stark. 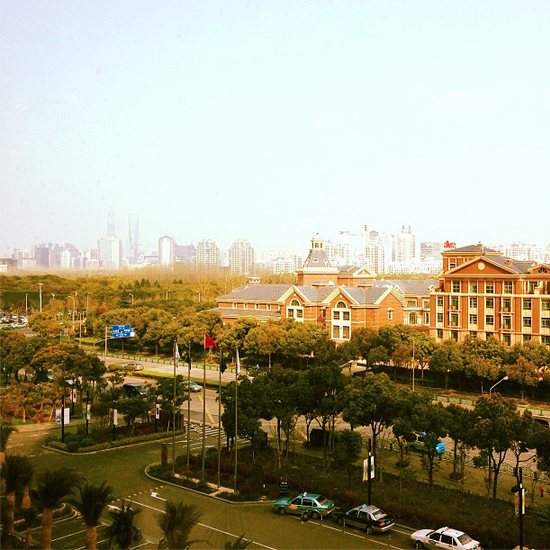 I did have some free time in Shanghai and got to experience the city’s social scene. I was amazed at how international Shanghai is, how similar it is to New York City, and how much fun it was to go out. One of the nightclubs I went to (Mint) had shark tanks as walls with baby sharks swimming around! Shanghai is definitely one of my favorite cities in the world and I hope to one day be able to live there for an extended period of time. Traveling around China took a lot out of me so I spent most April and May grounded in New York (I went to California for Coachella, which was incredible) While home, I attended some incredible interior design industry events, such as the Lennox Hill Design Event House Gala and the IDAD awards, where I met some incredibly talented interior designers with whom I have become very friendly. I also used this time to explore working with new architectural firms to help my vision of our in-store brand become a reality. We ended up hiring a very talented team from NY who is now working with me to renovate many of our existing and new locations including a complete store redesign in our Stark Home Costa Mesa location that will be a flagship store for our Stark Home retail concept. We have conceptualized layouts and displays that are entirely unique and the Costa Mesa project will be completed by March 2014. This new store will be unlike any carpet store anyone has ever seen before! During these 2 months, I connected with Stark’s customers on a more social and intimate level, and was able to learn in more detail their needs from a company like Stark. 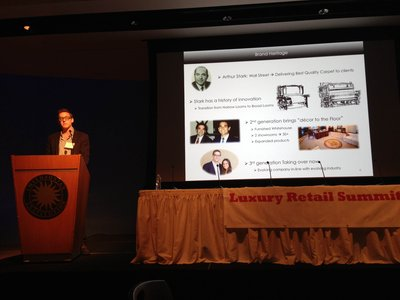 I also learned how different “retail” is from “to-the-trade” and now have a better understanding of the challenges my company faces when trying to sell direct-to-consumers, which I gave a presentation on in September at the Luxury Retail Summit. June was once again a month of traveling. I went to visit the prestigious Italian custom wood flooring company Arbol Milano based in Milan, Italy, and was able to negotiate and secure an exclusive US distribution partnership that will be kicking off in our NYC showroom in Q1 of 2014 under the brand Arbol Gallery Milano by Stark. Next, I went down to Calhoun, Georgia to visit Stark’s Warehouse, Distribution and Fabrication center. There, I discussed the implementation of a new Warehouse Management Software. I learned a lot about the intricacies of the custom and fabrication end of our business and how effective software solutions can make managing the operation more efficient. The end result was that we are implementing this new piece of software and will have all aspects of the business tied into one company-wide ERP system by the end of Q2 2014. After these work trips, I attended Birthright Israel through the organization Mayanot. That was my 1st time in Israel and it was an incredible experience because it connected me with my heritage on a deeper level than I previously knew possible. If you have not been to Israel and are eligible for Birthright, I strongly recommend signing up – after all, it’s free! I spent July in NY focused on uniting all Stark employees through various HR initiatives including the “World of Stark Internal Newsletter,” and the “Stark Learning Site:” The World of Stark Internal Newsletter is a bi-annual employee-only newsletter with information about new products and qualities, sales tactics, and other interesting company factoids. The Stark Leaning Site is an employee-only website that contains system and product training videos along with other relevant company information like workflow charts, the organizational structure, etc. Both HR initiatives were received incredibly, which galvanizes my opinion that HR will become increasingly more important to Stark in the coming years. August was especially stressful for me because we were finally integrating a major piece of the business onto this new ERP computer system I referenced above. For anyone who has been through the transition from one company-wide system to another, you know why I was so stressed. My team definitely made some mistakes in this integration, but it proved as a learning experience for everyone at Stark. We all used this to better prepare ourselves for the next phases of implementation. Change is tough, and I learned not to underestimate the difficulties change brings on. September was filled with troubleshooting the past month’s implementation but I was able to weave in some much-needed fun.I have a passion for public speaking, and gave a presentation at the Luxury Retail Summit in NYC about how I am evolving Stark from a traditional “trade-only” business to include retail as well. You can learn more about that here. I also visited my alameda, the University of Michigan, twice: once with my college friends for the Notre Dame Night Game that was a blast and once to attend MHacks, the world’s largest student-run hackathon event hosted by some of my good hacker friends. I launched a project called RapidMVP before this hackathon and received great feedback. Unfortunately, my duties at Stark have continually increased since then and RapidMVP has not really made much progress, but it is still a fun side-project because I love interacting with student hackers around the country. This experience further instilled into my mind that in order for you to succeed at something, you must commit to it and focus on it 100%, hence why I turned my attention back to Stark. At the end of this month, I attended a music festival called Tomorrow World….it was insane. If you like Electronic Dance Music, go next year. You won’t regret it! I was supposed to go to India for 2 weeks in October to attend the Veranasi Rug Fair and visit our manufacturing partners there like I did a year prior, but I was able to get out of it (whew – it’s an exhausting trip). My father ended up going with 2 other upper managers instead, which was great for me because it allowed me to focus on final stages of planning and design for our new website. While they were in India, I learned how grateful I am to have my father and those 2 upper managers in the office – I had twice as much work while they were gone and had to stay at the office until 10pm almost every night! It’s so incredibly valuable to have strong support if you want a business to succeed and I will never under-appreciate their help again! November and December were really “maintenance months” where I did not work on any new initiatives but rather had to manage my workload of everything planned for 2014: the completion of our website and launch of our digital strategy, the full ERP integration, the new storefront builds and renovations, the HR department expansion, and much more It’s been a stressful last 2 months, but I thankfully got to blow off some steam on my family’s annual ski trip to Aspen, Colorado. 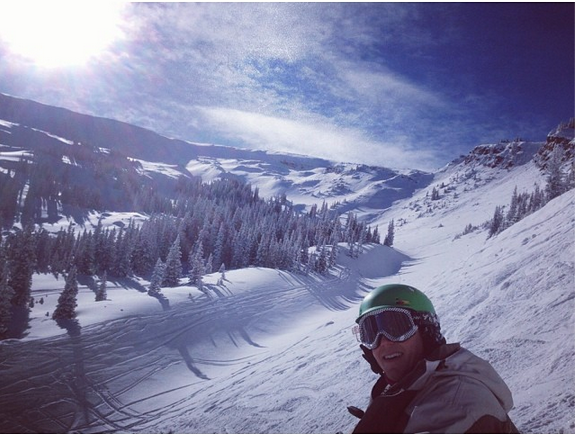 I got 10 amazing ski days in and hiked the highlands bowl 4 times in 4 days. What a trip! Sometimes it’s necessary to do something to take your mind off work so you don’t burn out, and that activity for me is skiing. Overall, 2013 was a great year: I made some great friends, experienced some incredible places, hired talented people, built tools to make my employees feel more connected to each other and do their jobs for efficiently, and took major steps to turn Stark into the company that I will one day run so my father can retire. Looking back, I wouldn’t have changed a thing. 2014 should be an even more exciting year for me personally and professionally. I already have a lot of travel plans for both work and pleasure. However, I’m most excited to see all of the initiatives I’ve been working on for over a year come to fruition. The new store concept and digital strategy are what I’m most looking forward to because I strongly believe they will invigorate the perception of our company and the direction myself and my cousin Ashley are taking Stark. I have a never ending list of projects to tackle and I’m hoping 2014 is the year I truly prove my value to my family and my company so that I can continue making the improvements I have conceptualized at a more exponential rate. Life is too short to not care about yourself or the people you love. Don’t take anything for granted and appreciate all that you have and all that you can do. Here’s to a happy, healthy, and prosperous 2014 for us all! Very impressive, it put tears in my eyes reading this. What a great achievement Chad, Congratulations and I’m very happy to read and see you on FB with your achievements in life. I have looked after you and your sister Skylar during the weekends in your Hampton residence as well on 59th St. 5th Avenue many years ago. You and your sister Skylar were about 4/5 years old then . Shanon then, were just starting university. I have met Steven and Candice last during my last trip to NYC back 1997 I think it was. Arlene was your baby sitter and I was babysitting for Skylar. I had so much fun then working for the Stark. Kindly get back to me when you have a moment, and would like to discuss some interior design business in Asia. My kindest regards to Steven and Candice and most especially my kisses to Skylar.